At DADC, their philosophy is simple: deliver the best driving experience possible. Their hand controls are designed to become one with your car, so you are not driving a hand control you are driving your car. They use quality materials, including durable stainless steel for an attractive finished product. DADC uses self-lubricating components to eliminate maintenance, squeaks and grease stains on clothes. Holding the DADC hand control in your hand feels light and natural, which is why our clients prefer it. Our ergonomic design is an extension of the body’s natural responses to reduce fatigue, especially on long distance drives or in stop and go traffic. DADC's founder’s son, Roger, is a racer, so when it came to design, it was important for William to build a hand control that delivered on the racetrack not only the road. The patented vacuum assist provides better throttle control, especially in tight turns or on bumpy roads. DADC hand controls fit a wide range of vehicles with little or no cutting to the dashboard. Our cable operated throttle control means a cockpit free of clutter and unencumbered access for you and your pedal pushing family and friends. This automobile handicapped hand control works with a vacuum assisted twist grip to give you precise, effortless, finger-tip control of the throttle. In addition, the floor area is free, making it possible for other drivers to easily share a vehicle equipped with this system. The twist approach uses less space than other lever actuated hand controls. The 500P model offers the same vacuum assist capabilities as the 500 model, but uses a pull throttle to control acceleration and braking instead of a twisting action. This motion gives those with limited gripping capacity the same effortless operation as the 500 model and uses only a little more room for operation. Both the DADC500 and DADC500P provide a rugged and seemingly simple ergonomic design, allowing the driver to rest a hand on the handle while controlling the vehicle through turns and over rough roads. This results in better control and less fatigue, especially on long trips. We've been installing these all over New England for close to 20 years. Bob in NY loves his, Ron in RI has had his installed in two different cars, George in MA says "there his favorite hand controls ever" Don in Vermont says "there the only hand controls he'll ever use" John in Maine says he'll "never go back to right angle hand controls" Gregg in NH say "there the finest hand controls he's ever had"
Attractive appearance! Resilient, comfortable control grip. Maintenance free! Self lubricating components used throughout. All fasteners and major parts are high-strength stainless steel. Accepted by the V. A. Meets or exceeds all requirements of S.A.E. J1903 JUL89. Licensed under U.S. Patent No. 4436191. But what about cruise you ask? Will it still function? Not to worry. Cruise control is fully operational even when the adaptive driving aid is engaged. Remember, the DADC adaptive driving aid does not replace the pedals that came with your vehicle, but is added to them. This also means that able bodied drivers can operate your modified vehicle normally, without learning to use the adaptive driving aid that makes it possible for you to operate your own vehicle. Put yourself safely and confidently behind the wheel by contraction us oday to determine which Driving Aids Development Corporation model best fits your needs and schedule your installation appointment. 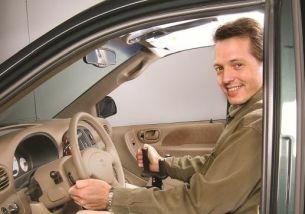 Vacuum assisted, motorcycle styled twist handle for throttle and push for brakes. Vaccume assisted, traditional push-pull handle, pull for gas, push for brake. Traditional push-pull handle, pull for gas, push for brake. Rock back for gas and push for brake. Traditional push-pull handle, push for brake. Developed for people with Rheumatiod Arthritis. Fits in tight spaces and gives hurting hands leverage on the key. Enjoy the action of online simulated driving and racing.